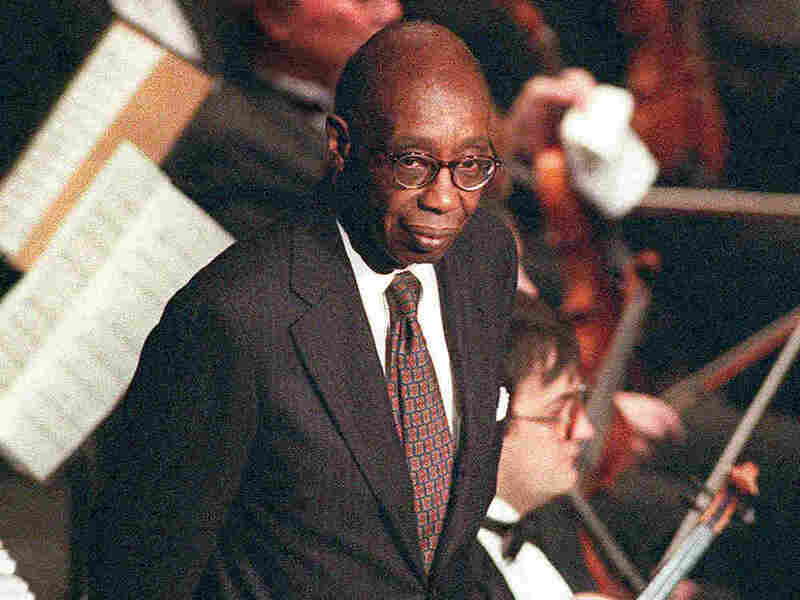 George Walker, Trailblazing American Composer, Dies At 96 : Deceptive Cadence The composer, whose music fused many styles with a singular voice, constantly broke new ground. He was the first African-American to win the Pulitzer Prize for music. Pulitzer Prize-winning composer, pianist and educator George Walker has died at the age of 96. Walker's death was first announced to NPR by one of his family members, Karen Schaefer. Gregory Walker, the composer's son, said his father died after complications of a kidney ailment Thursday at Mountainside Hospital in Montclair, N.J.
Walker's music was firmly rooted in the modern classical tradition, but also drew from African-American spirituals and jazz. His nearly 100 compositions range broadly, from intricately orchestrated symphonic works and concertos to intimate songs and solo piano pieces. "His music is always characterized by a great sense of dignity, which is how he always comported himself," says composer Jeffrey Mumford, who, as a music professor at Lorain County Community College in Ohio, uses examples of Walker's music in his classes. "His style evolved over the years; his earlier works, some written while still a student, embodied an impressive clarity and elegance." Walker was a trailblazing man of "firsts," and not just because of the Pulitzer. In the year 1945 alone, he was the first African-American pianist to play a recital at New York's Town Hall, the first black instrumentalist to play solo with the Philadelphia Orchestra and the first black graduate of the Curtis Institute of Music in Philadelphia. The following year, Walker wrote his first string quartet. In 1990, he revised the second movement into a new piece, Lyric for Strings, which has become his most often-performed work. In 1996, Walker broke new ground again when he became the first African-American composer to win a Pulitzer Prize for music. Lilacs for voice and orchestra, set to a text by Walt Whitman, is a moving meditation on the assassination of President Abraham Lincoln. Mumford likes to recall a story about Walker's Paris years with Boulanger. "She was so impressed with his musicianship that she waived the regular requirements she made of students," Mumford says. "He could bring anything he wanted to show her at lessons." Walker's reputation as a composer of works for orchestras like the New York Philharmonic, the Cleveland Orchestra and the Boston Symphony slowly grew, but Mumford says Walker's fame was hard-won. "We have a great deal of work to do regarding orchestra programming of composers of color," Mumford says. "Walker deserved many more performances than he has received thus far. Sad to say that even the work that earned him the Pulitzer has not graced the concert hall nearly enough." Walker is often identified as an "African-American" composer instead of simply an American composer. In a 1987 interview with broadcaster Bruce Duffie, Walker said there are two sides to that label. "I've benefited from being a black composer in the sense that when there are symposiums given of music by black composers, I would get performances by orchestras that otherwise would not have done the works," Walker said. "The other aspect, of course, is that if I were not black, I would have had a far wider dispersion of my music and more performances." Mark Clague, who wrote the entry on George Walker for the International Dictionary of Black Composers, points to elements of race and politics in Walker's compositions. "He constructs his music so that the unknowing listener should not be able to distinguish it from that of his 'canonized' white contemporaries," Clague writes, citing influences from Stravinsky, Debussy and the serialist school of composers. "He frequently draws on black musical idioms, such as spirituals, blues patterns and jazz tropes. Walker's music, however, is not a collage of modern styles, or a pastiche, but has its own distinct voice." In 2009, Walker told NPR's All Things Considered that as a composer, right from the start, he knew he had to become an individual. "I had to find my own way," he said. "A way of doing something that was different, something that I would be satisfied with." Walker had a long and distinguished academic career. He held teaching posts at New York's New School, Rutgers University in New Jersey (where he chaired the music department), the University of Colorado, the Peabody Institute in Maryland, the University of Delaware and at Smith College, where he became the first black tenured faculty member. Walker received two Guggenheim Fellowships, an American Academy of Arts and Letters Award, and honorary doctorates from six institutions, including Oberlin and Spelman Colleges. In 1997, Washington D.C.'s mayor, Marion Barry, declared June 17th as George Walker Day. Walker is survived by two sons: Ian Walker, a playwright, and Gregory T.S. Walker, a violinist and former concertmaster of the Boulder Philharmonic Orchestra in Colorado, who said that his father was still active, working on commissions at the time of his death. Editor's Note: This story has been updated to include a more specific cause of George Walker's death.